Once you’ve experienced homemade tartar sauce such as this, there’s no going back to the commercial stuff made with corn syrup and preservatives. No way. Grated onion is a wonderful way to add flavor to homemade sauces, dressings, and dips. People don’t even know it’s in there, but it really enhances the flavor. Grating an onion is as simple as it sounds. Simply peel the skin from an onion. Trim away the stem end, but leave the root intact. Hold the stem end of the onion against the fine side of a box grater or cheese grater and grate over a bowl. You may need to scoop the pulp off the inside of the grater with your fingertips. You can store grated onion pulp, covered, in the refrigerator for up to 1 week. The flavor and pungency will diminish over time. Homemade Tartar Sauce Recipe © 2013 Erin Coopey . Photo © 2013 Rina Jordan. All rights reserved. All recipes and photos used with permission of the publisher. Oh my, this homemade tartar sauce recipe has to be one of the most flavorful, fresh-tasting sauces I've ever come across. The recipe is perfect in that I didn't have to adjust any seasonings. The salt, tang, and sweetness were equally balanced, and it's a cinch to make. The dill pickles I used were homemade from this past summer and I made my own mayonnaise from the recipe on this site. I refrigerated the sauce for about an hour before serving it with the Pan-Fried Fish With Cauliflower. Why buy tartar sauce when it can so easily be made from pantry ingredients? The homemade tartar sauce recipe is easy to pull together and quick to make. With just a few minutes grating and chopping, there you are, done. I liked the idea of grating the onion in and it was undetectable in the finished sauce. I was a little pressed for time, so I used a good store-bought mayonnaise this time. I would shy away from the mayonnaise-type dressings for this as I think the taste might not be as good. I will say that this sauce does get better with age. It was tasty after half an hour, but it was so much better the next day. The only thing preventing this from being a perfect 10 in my book is I wanted a little more lemon zing in the final taste. I'll certainly make this again and again, but next time I'll grate a little lemon zest into the sauce to give it a little more zing, and maybe make my own mayonnaise. I haven't purchased tartar sauce from the store in a long, long time, so I can't say how this compares to the jarred stuff, but I can say that it's far superior to anything I've ever been served in a restaurant. Whenever I used to make tartar sauce at home, I used to just throw this and that into some Hellmann's mayo. It was always fine, but I'll never stray from this recipe. It's not sweet, which is what most people expect from a tartar sauce; instead, prepare yourself for the delightful combination of salty capers, sour pickles, and grassy parsley. I did stick to Hellmann's as the base, although maybe I'll try homemade mayo next time. The lemon juice and grated onion balanced everything perfectly, although I don't think you could pick out the flavors if you didn't know about them ahead of time. I'd definitely suggest making this at least 4 to 5 hours ahead of time to let the flavors marry—a perfect make-ahead item! I must insist that you really finely mince the capers and pickles so the resulting sauce is still smooth and not crunchy. After tasting the recipe as is, I mixed in some fleur de sel and freshly ground black pepper and achieved what I deemed to be the perfect tartar sauce. Wow! I've always purchased store-bought tartar sauce, but never again. I've already made this recipe three times. It's simple, straightforward, and delicious. I've made this recipe with the mayonnaise recipe on the site (my go-to recipe) and with store-bought mayo. Both were delicious. One night I served grilled salmon for dinner just to have an excuse to eat this sauce! This is a very simple solution for all your tartar sauce needs. The addition of capers is absolutely FABULOUS. It takes only a couple of minutes to put this together. Honestly, the possibilities are endless in terms of what you can dice and add to your mayo but this recipe is perfect as written. This is my new standard for tartar sauce. For some reason, tartar sauce always ends up being a last-minute, thrown-together thing at our house. We go through the entire process of preparing the fish and cooking it, and then suddenly we realize that we don't have any tartar sauce. I refuse to use the commercial stuff and I like for the sauce to be as fresh as possible, hence, the last-minute scramble. I usually throw the sauce together without really measuring, and it is very much "to taste." But this recipe caught my eye because of the specific ingredients and amounts—no more guessing and tasting along the way. The ingredients are pretty much what I've used in the past, except for the fresh parsley, which adds a very nice touch. However, the standout in this recipe is the grated onion. I was afraid that grating it may enhance the flavor too much and make it overpowering, but I think that 1 teaspoon is just the right amount. It brings up the flavor of the tartar sauce without dominating it. I used store-bought mayonnaise, but will try it later with homemade, or may even try using milk mayonnaise. The amounts of pickle, capers, and lemon juice are just right. No more last-minute guessing! I whipped up a batch of this tasty tartar sauce in less than 15 minutes. It had very good flavor with the dill pickles instead of sweet pickle relish—it was a really nice, fresh, and balanced savory flavor that complemented lightly battered baked haddock. I used a microplane to grate the onion. The little bit of tartar sauce that was left over went wonderfully on a seafood sandwich the next day. I have this one memorized and ready to use as a staple! I especially like the addition of the grated onion in this tartar sauce. It really makes a difference. I use grated onion in my latkes, but never thought of adding it to tartar sauce. It's a great idea. The author of this recipe makes two really good points with which I agree wholeheartedly. The first is that commercial tartar sauce is sweetened to the point of being unpalatable, not to mention being polluted with unwanted thickeners and other junk. The second is the power of grated onion, which is absolutely THE way to incorporate onion (or, for that matter, garlic, ginger, horseradish, etc.) into a dip. The flavor will be stronger grated than minced, so a little dab'll do ya, as they say. Consider this recipe a launchpad. It's a solid template for a tartar sauce, but you can customize it as you see fit. Use tarragon instead of parsley. If you want it sweeter, use a sweeter pickle, like a bread and butter, or cheat and use sweet or dill relish. Want it a bit spicy? Dice up a pickled jalapeño. Make your own mayo to ensure it's over-the-top delicious, although the sauce is still head and shoulders above a bottled tartar sauce if you use a good-quality store-bought mayo (I'm in the Duke's camp myself). Serve this with any fish, but especially fried catfish or flounder. Also, a good tartar sauce is a fantastic dip for french fries— my guilty pleasure. Yes, yes, yes. I use the recipe for tartar sauce from Rebecca Charles of (the marvelous) Pearl Oyster Bar on Cornelia Street in NYC, the only restaurant it is guaranteed I will go to on a moment’s notice. It is a very similar condiment, but I don’t use parsley, and I use (only the brand) Maille Cornichons instead of dill pickles, which find superior and recommend trying. I was once in Fairway when a shopper couldn’t find bottled tartar sauce, and I stood there and told him how to make his own. I hope he did. As long as we have people like you, victoria2nyc, in the world, there will always be restaurants and there will always be home cooking. Brava. And cookbooks! 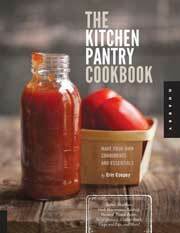 I had not heard of this cookbook, The Kitchen Pantry, but I just ordered it. In 2014 I am going to be moving from NYC to the country. I mean, really, to the country. Instead of walking 1 1/2 blocks to a supermarket, I will have to drive 35 minutes–on a good day. I think this book will be fabulous for me to mess around with. No high fructose corn syrup in sight. THANK YOU! victoria2nyc, my condolences, er, congrats on moving to the country. I loooooove it, but I think you’re going to be in a much more rural spot than Roxbury, CT. The recipe calls for either homemade or store-bought mayonnaise. Now, I’m Dutch and Tarantino says I know my mayonnaise. My advice: make it yourself. Really. If not for the taste and creaminess, just for the joy of seeing oil and egg yolk change into a thick and creamy sauce. It’s magic, honestly. Forget climbing Mount Everest, forget skydiving, making mayonnaise just tops it all. This recipe is really similar to mine but I like to use shallots instead of onion. Why would you ever buy something that is so simple to make yourself??? I couldn’t agree with you more, Steve f.
This is pretty much my standard tartar sauce recipe. I also include a teaspoon of prepared horseradish cream, teaspoon of chopped fresh dill, and a dash of Tobasco. This goes with me to the church-based fish fries of Lent. In fact I use fish as an excuse to eat tartar sauce. This is also great on a burger. Sue, I love the fact that you bring the starter sauce to the fish fries at church. Nothing beats homemade, right, Sue? I add chopped green olives to the recipe for my tartar sauce. Ooooh, I like that, Leia. While we have never purchased tartar sauce our (my grandmother’s; my mother’s; and now my) tartar sauce uses sweet relish. I can’t really call it a recipe because it has always been more of a toss-together of these ingredients until it tastes right affair. The rest of the ingredients are the same, except the onion was chopped and celery is in the mix. I tend to toss everything in the mini chopper then blend. I will have to try this with dill pickles or dill relish and for once actually follow a recipe. Anne, I think your multigenerational approach seems to work! I like the additions. Please drop me a line when you’ve made the recipe as written. I’m curious to know what you think. Change the onion to shallots, don’t need the lemon juice, and use slotted spoon for the capers get a little juice. That’s my recipe. D, I’m certain that would work, too. Love when readers share their tweaks on a recipe. Thanks! This is almost my tartar sauce “recipe,” although I, too, am a throw together tartar sauce maker. It has to have capers! I grew up on Best Foods tartar sauce, which was not at all sweet and had an indefinable something that I craved. It wasn’t until someone told me that capers were that “something” that I learned to make my own. I prefer thinly sliced, then chopped, green onions in mine, and everything else minimally chopped (we like ours a bit chunky like Best Foods) sometimes with the addition of pickled tarragon — the byproduct of my white wine tarragon vinegar making). Wonderful, Ruthie. I love onion in tartar sauce, too. This truly is the best place to come to for recipes of products you DON’T want to buy in the store. Olivia, that is truly high praise. We so appreciate it! In the restaurant, we made our tartar sauce. We used the machine grinder (like the type for grinding meat) and added chopped onion, dill pickles, and parsley, and then mixed it into the mayonnaise and Dijon mustard. Never did like the grocery store bought tartar sauce. Personally, I like to add garlic powder instead of onion when making it at home. Homemade (or restaurantmade!) is always better than store-bought, isn’t it, June? Thanks so much for sharing this with us. 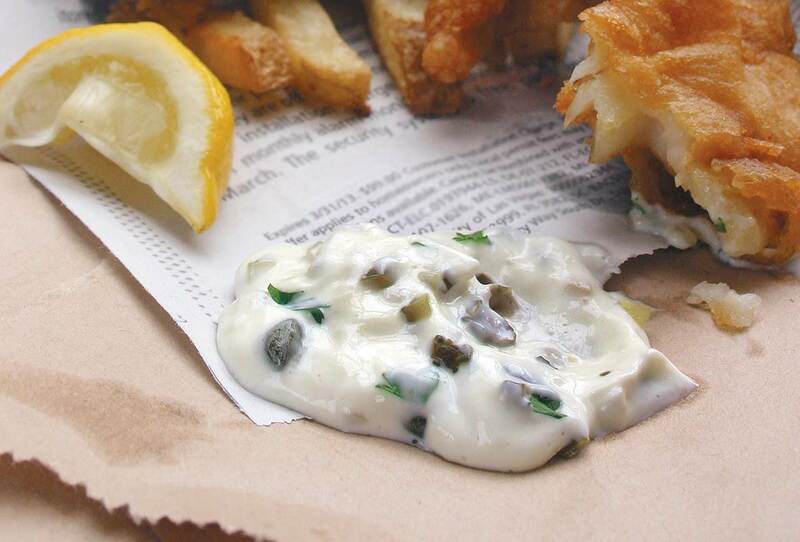 Your homemade tartar sauce recipe can also be done with either India relish or regular relish with mayo.